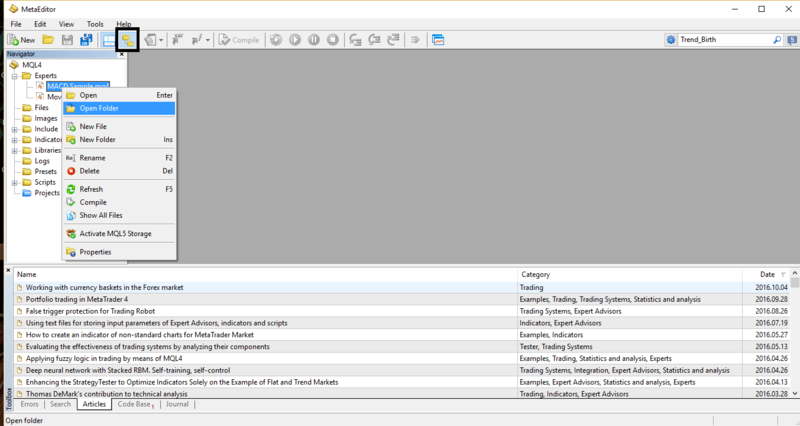 Follow these 11 steps to quickly load Expert Advisors in MetaTrader. Configure the Expert Advisors input parameters. Additional function: the automatic rollover of the contract if you're not trading continuous futures contracts. The enabled icon is the green one. 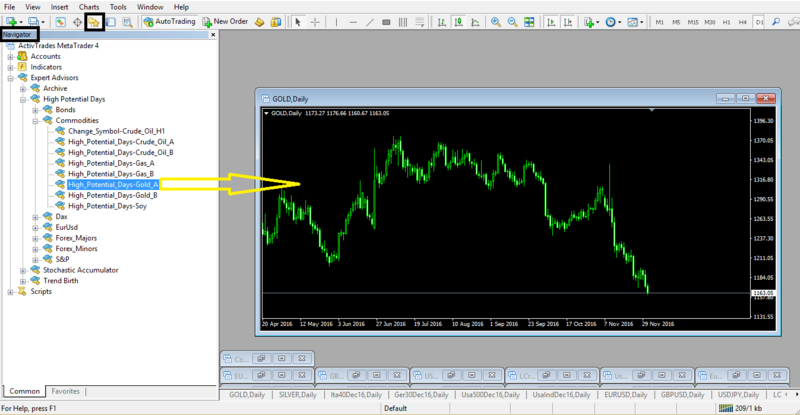 If you don't see the icon in your MT4 menu, add it by right clicking on menu => select ‘AutoTrading' and click 'Insert'. Then open the Navigator of Metaeditor –> right clic on ‘Expert’ folder –> ‘Open Folder’ => and paste inside the Experts. Then I suggest you to create a shortcut of Mt4 ‘Expert’ folder on your desktop to open it easier the next time. Reset MT4 (fastly) now close and re-openMetatrader to compile all Expert Advisors automatically otherwise they would not appear in Metatrader's Navigator. Or open them on Metaeditor and 'compile all open files'. Now if you have our experts, activate the drawdown and performance recording system. 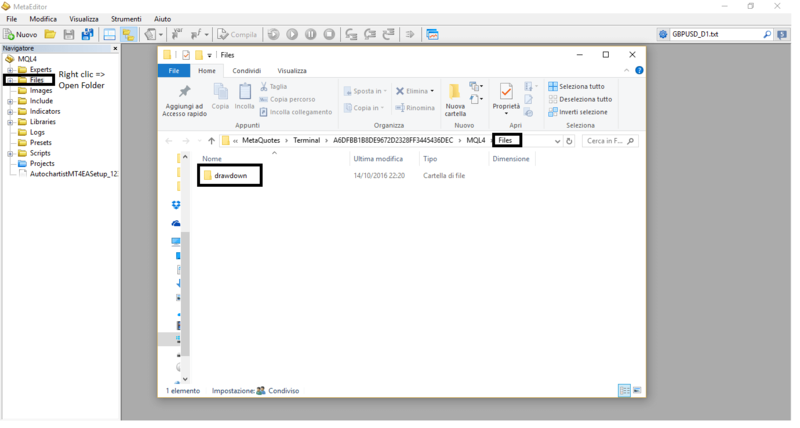 Open 'Files' folder (it is the folder below 'Expert') and paste here the folder containing the .txt files where the experts will register each operation from a starting capital. Then when each one will open the next trade he will check if his performance is above the drawdown setted in input parameters. If it is over he will trade just virtually, not with real or demo money. When and only if he will come back under its max_drawdown he will start trading again using account's money. Paste here even the 'Templates' folder. In Symbol list's window, search the symbols in your broker's folders --> double clic above the symbol you want to add. From ‘Navigator’ find in ‘Experts’ folder the .ex4 files => double click or drop the expert to charts. 'Allow import of external experts'. If you are going to backtest the strategy with our Expert Advisors, set the value of backtest_mode = 1. If you are going to trade live, set backtest_mode = 0. 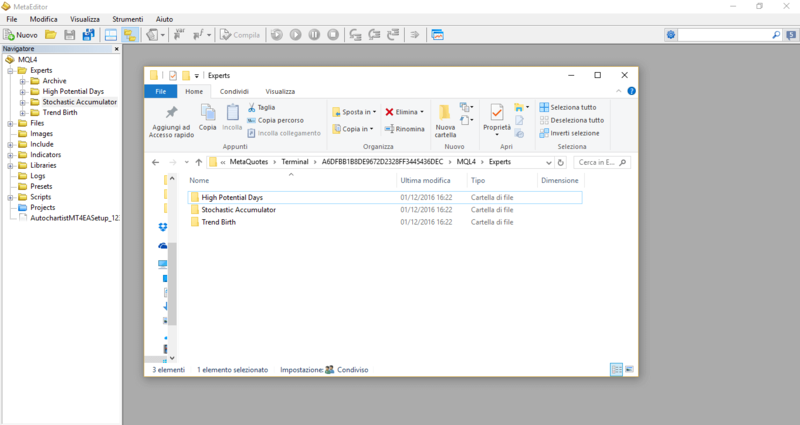 In this mode the experts will record performances so it is necessary to import the 'drawdown' folder, otherwise the expert will return 'zero divide' error. In both of the mode it's possible to increase or decrease the risk for each operation (percentual of loss in account equity if the stop loss would be hit) by modifying ‘risk’ parameter. If you modify the 'risk', modify also and proportionally ‘max drawdown’ parameter. During trading activity check that everything is working fine in Metatrader ‘Experts section', especially if you're not going to use a virtual private server. There could be problems due to internet connection, PC updates etc. Just check once a day from 'Terminal' menu --> 'Experts' that everything is fine: the experts are running, that your computer (or better, vps) is on, that the internet connection is ok etc. An error is a red circle icon, the yellow triangle is a notification (not a problem). We implemented the automatic rollover function and it is very convenient if you trade in a broker that has not continuous cfd. It would be very boring to update manually the new contracts when they expire. The robots will do automatically the rollover when a new contract will be quoted. If you don’t want to use this function leave the default inputs, the function will not cause errors even if it is not setted well. For example Dax futures contract expire around the 20th day of March, June, September and December. 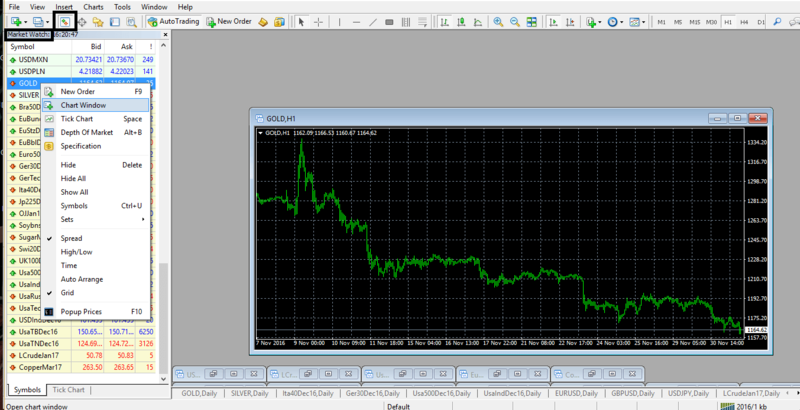 Few days ago, for example on 15th day of these months, the expert reload automatically the chart with the new contract. And so on year over year. Each CFD of a instrument, quoted in different broker, has always the same expiration months because every of these CFD are underlying of the same futures contract (example: Dax30Mar16, Ger30Mar16, DaxH16, GDaxH6 etc). The problem is that every broker call its CFD almost always with a different name from another brokers. So in input parameter insert in the ‘cfd’ string field, the name your broker give to its CFD (Dax, Ger30, Dax, GDax). 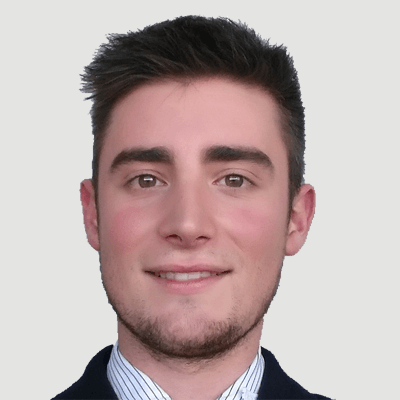 The default name of our experts are the ActivTrades’s CFD names. To create the name of the Symbol the function use this string concatenation: "CFD"+"Month"+"Year_digits"